Mens harley davidson button shirt 3xl. Condition is Pre-owned. Shipped with USPS First Class Package. Genuine Harley Davidson Work Garage Shop Button Motorcycle Shirt Mens XL. Condition is Pre-owned. Shipped with USPS First Class Package. Thanks for looking. Harley Davidson Sleeveless Vest Shirt Mens Medium Button Up Khaki or Tan in Color Embroidered CA03402 RN103819. Condition is Good Distressed Look Pre-owned from a pet free smoke free home. Shipped Fast and Free with USPS First Class Package. Colorado Rockies Thunder Mountain Loveland CO on the back. Review the pics, Nice shirt! You'll look great. Great Graphics. spot/stain free! Dual skulls, Grand Junction HD on the back. Review the pics, great shirt! 100% cotton - very good looking! Size " Extra Large". Great Graphics. spot/stain free! Style: Motorcycles; Tifton. Size: 5XL (XXXXXL). 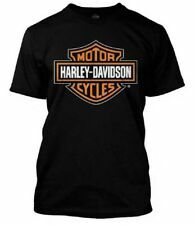 This is a really nice Harley-Davidson S/S T-Shirt. It is in very good condition. Black: Armpit to Armpit 31"; Neck to Tail 30". Harley Davidson Men’s Medium Short Sleeve Button Front Shirt Black in Color With Orange Stitched Embroidered HD Harley Davidson RN#103819 CA#03402. Condition is Good Pre-owned comes from smoke free pet free home. Shipped Fast And Free with USPS First Class Package. Mens Harley-Davidson Blue Stripped Short Sleeve Button Up Shirt Size 2XL Two button pockets on front of shirt with Harley-Davidson Logo Above Left Pocket Harley-Davidson Logo on the back of shirt Part# 96231-09VM Armpit to armpit of this is about 28.5 inches. Top to bottom is about 31.5 inches. All items come from smoke and pet free house!!! Please ask any questions!!! Pre-owned: Harley-Davidson Motorcycles shirt - Designed by Trunk. Shirt is in GREAT condition, unless otherwise noted above in item specif ics. All photos are of the actual item. Length top to bottom - approx. Mens Harley-Davidson White Stripper Short Sleeve Button Up Shirt Size 2XL Two button pockets on front of shirt with HDMC logo on one pocket and dark custom #1 logo on the other pocket Nothing on the back of shirt Part# 96001-10VM Armpit to armpit of this is about 28.5 inches. Top to bottom is about 31.5 inches. All items come from smoke and pet free house!!! Please ask any questions!!! 26 " Length (Base Collar To Hem Down Back). 21" Chest (Pit-Pit Across Front). Men’s Harley-Davidson Black Striped Short Sleeve Button up Shirt Size 2XL Two button pockets on the front of shirt with H-D logo above the left pocket Nothing on the back of this shirt. Part# 96243-08VM Armpit to armpit of this is about 28.5 inches. Top to bottom is about 31.5 inches. All items come from smoke and pet free house!!! Please ask any questions!!! Men’s Harley-Davidson Black And Yellow Short sleeve shirt size 2XL Two button pockets on the front of shirt with H-D logo above the left pocket Nothing on the back of this shirt. Harley-Davidson on shoulders of shirt Part# 96465-11VM Armpit to armpit of this is about 28.5 inches. Top to bottom is about 31.5 inches. All items come from smoke and pet free house!!! Please ask any questions!!! Men’s Harley-Davidson Black & Green Color Block Short sleeve shirt size 2XL Embroidered Harley-Davidson logo on the front of shirt Embroidered Harley-Davidson logo on the back of shirt and small Willie G logo on the back of shirt Part# 96434-11VM Armpit to armpit of this is about 28.5 inches. Top to bottom is about 31.5 inches. All items come from smoke and pet free house!!! Please ask any questions!!! Harley Davidson Mens Willie G. Skull Long Sleeve Shirt missing tags XL.